Elizabeth Ames Jones is a strong conservative leader for the state of Texas. A member of the legendary Texas Railroad Commission, she is responsible for regulating the state’s oil and gas production, pipeline safety, and the permitting and reclamation of coal mining operations. 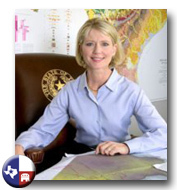 She was appointed in 2005 by Governor Perry and elected in 2006 for a full term. Published in the Wall Street Journal, the Washington Post and many other major newspapers she is a recognized leader in the area of energy policy. She is a staunch opponent of the “cap and trade” energy tax plan because it will dramatically increase the cost of energy and result in significant job loss. Prior to her service on the Railroad Commission she was elected three times to the Texas House of Representatives where she was an outspoken advocate for property tax relief and appraisal reform to protect homeowners and businesses from unfair appraisals. Because of her strong leadership qualities she was chosen by her colleagues to be Vice Chair of the Republican Caucus in only her second term. As part of the Republican leadership she helped coordinate the effort to pass sweeping tort reform legislation. Elizabeth demonstrated her commitment to fiscal responsibility while serving as a member of the House Appropriations Committee during the budget crisis post September 11, 2001 where she helped craft a historic budget that cut actual state spending for the first time in over 50 years. Elizabeth, a strong advocate of our Second Amendment freedoms, is an outdoor enthusiast and avid hunter who was recently profiled in Texas Trophy Hunter magazine. A graduate of the University of Texas at Austin, Elizabeth and her husband Will are the parents of two college age children and have been married for over 25 years. Elizabeth Ames Jones is currently campaigning for U.S. Senator. You can also follow Elizabeth Ames Jones on Twitter.